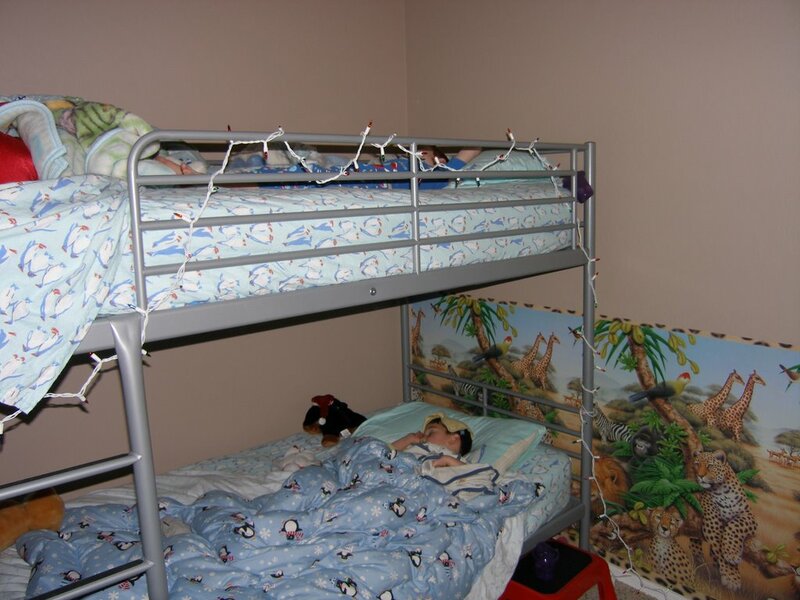 We'd talked about getting bunk beds for the boys ever since we moved them into one room and made the other room a playroom. (which was about 2.5 years ago?) It seemed like a great idea - bunk beds would take up less room, leaving them more floor space. We found a great deal on Ikea bunk beds in their "AS IS" section and snapped them up before Christmas (I think we bought them for $20!). 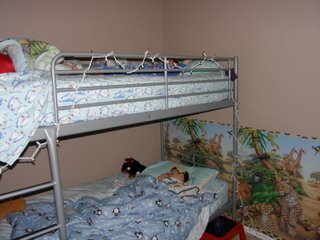 The boys were excited about moving out of their toddler beds, and looking forward to the bunk beds. Until . . . I found out what a difficult and time consuming thing it was to change the top sheets. For someone who changes the sheets on a weekly basis, it was annoying. For someone whose son stopped sleeping in pull-ups, and started having accidents, it was very annoying! Add that to the fact that C felt "lonely" on the top bunk and often curled up at the foot of N's bed so he wouldn't be alone. And, then the boys realized they could climb to the pot shelf from the top bunk and I'd come in and find them sitting extremely close to the ceiling. And the fact they could touch the ceiling fan. There were a lot of factors playing when I started telling B I wanted to get rid of the bunk beds! So, back to Ikea's "AS IS" section where B found 2 twin size beds with drawers underneath to replace the bunk beds. It'll be a few days before he has the opportunity to put them together, but I can't wait. These beds weren't as amazing a deal as the bunk beds were . . . but they were 50% off regular retail, so I'm not complaining. While they're losing floor space, hopefully C won't feel lonely and perhaps he'll spend the entire night in his rooms more than once in a blue moon? About the picture - N often sleeps with one of his blankies covering his head like a little hat. He'll be all set if we ever move back to a cold climate. LOL!